Whether you are headed to a casual backyard barbecue, a sunny poolside party or a romantic outdoor wedding, we have the perfect summer outfit for you. With these fashion tips and shopping suggestions, you'll look fabulous no matter what type of summer party you are attending. For a backyard summer barbecue, keep your outfit casual and cool, while still being stylish not sloppy. Brighten up your look with a colorful tank top. We love the lean look of the Emily Blu tunic tank from Nordstrom, priced at $24. This cute scoopneck tank comes in your choice of 11 colors. White capris are always a cool choice for summertime unless you are going to be playing sports (if so, put on shorts) or you think you might get dirty (switch out white for blue denim capris). We like the comfort and fit of Intro easy waist capris, available at Dillard's for $40. Skip the flip flops and put on a pair of cute flat sandals embellished with beads, jewels or other accents. 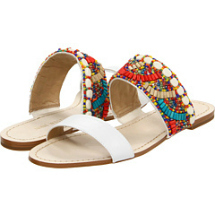 Check out the Nine West Sugar Rush beaded leather sandals, priced at $89 from Lord & Taylor. For casual events, you want a soft-fabric body bag you can just throw all your essentials inside and go. 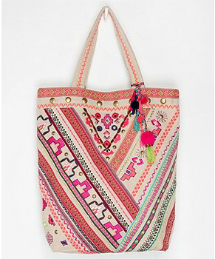 The Ecote Geo and Bells tote bag from Urban Outfitters is a fabulous choice, on sale now for just $25. If you are headed to a pool party, whether for adults, kids or both, pick a cute tankini and add some sweet summer accessories. If you want the convenience of a two-piece (seriously, who wants to get completely undressed just to pee?) but the coverage of a one-piece, pick a tankini. Striped tankinis are all the rage this season. We love the stylish simplicity of the JAG striped crisscross tankini top, on sale for $55 at Macy's. Partner this tankini top with boyshort bottoms for that extra coverage you need at a pool party. When you get out of the pool, throw on a cute cover-up. Swimsuit cover-ups come in a variety of styles, from tunics to maxi dresses to shorts. We adore the Tommy Bahama ombre stripe cover-up dress in bright marina blue. It's on sale right now at Nordstrom, marked down just under $89. When you are laying poolside, protect your eyes from the sun's harmful rays with a pair of aviator sunglasses. Aviators are classic and are always in style, year in and year out. You don't have to break the bank on a pair of shades. 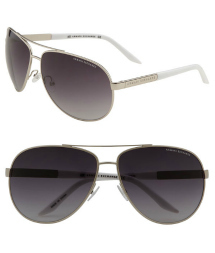 These AX Armani Exchange metal aviator sunglasses are priced at $65 at Nordstrom. And for something even cheaper, take a look at the Icon Helen aviators eyewear for just $12. Pack all your outdoor essentials in an oversized straw tote. 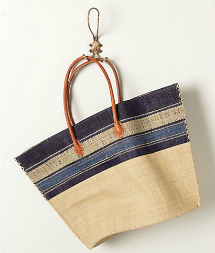 The striped straw tote from Anthropologie has a nautical appeal. At over 21 inches wide, it's roomy enough to carry everything you need, and this straw tote is priced at $68. If you have been invited to an outdoor wedding, it can be difficult to figure out what to wear. Don't assume that since it's outdoors, it's going to be an extremely casual affair. Some very formal weddings are held outdoors these days. For an afternoon wedding, you can't go wrong with a knee-length dress and a great pair of sandals. 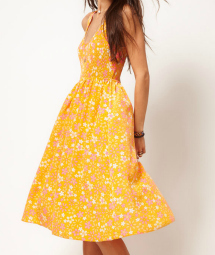 The ASOS floral print midi dress is a beautiful choice with gentle pleating and a fluid skirt. On sale now from ASOS.com for just $41, it's a terrific buy. A headband or head wrap is a fabulous way to keep your hairstyle looking great in the breezy summer weather. For a wedding, try something a little fancier than you'd normally wear. The Cara Accessories Alicia's Favorite flower head wrap in ivory is a stunning choice. It's affordably priced at just $38 at Nordstrom. Step into wedges for outdoor events. They are dressier than flats but not dangerous on outdoor surfaces like stilettos or other skinny-heeled shoes. 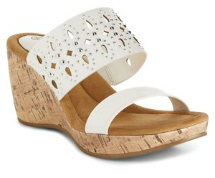 These Giani Bernini wedge sandals are priced at $50 and available in three colors at Macy's. For a daytime wedding, you don't need to go overboard with jewelry. Pick one piece that you love and you don't need much else. 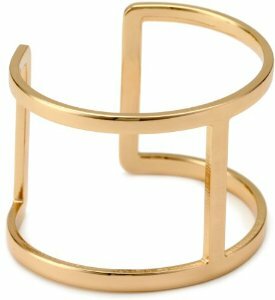 We like a great pair of hoop earrings or a chic cuff bracelet. You'll love the subtle glamour of the Vince Camuto cut out cuff bracelet in rose gold, priced at $48 at Endless.